Hi and welcome to the Paper Crafts and Scrapbooking Blog Hop! This is a hop to thanks the staff there for all the amazing creativity, passion and hard work that it takes to put together a publication. It’s been a pleasure welcoming you into my home every month! I will miss the inspiration! You may have arrived here from Laura Pryor at Lil’ Inker Designs, welcome! 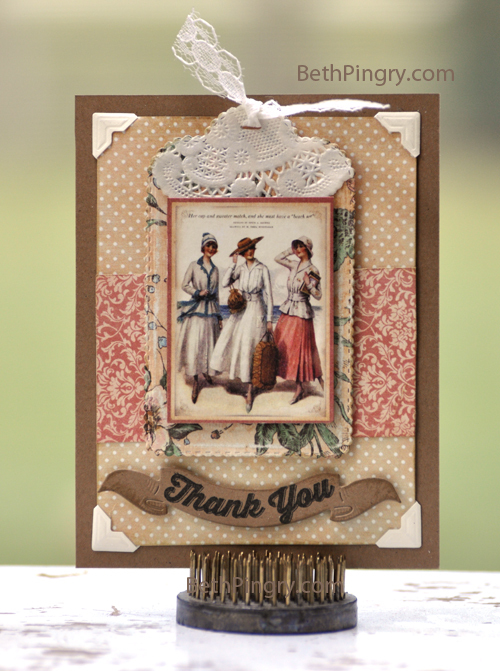 I have Thank You card created from some of my favorites, Graphic 45 and A Jillian Vance Design. I used this image because it shows the lady holding a book , or maybe an iPad, so she can catch up on her PCS subscription! Thanks for visiting, you can also find me on Facebook, Pinterest, Instagram, and Twitter. The next stop on the hop is A Jillian Vance Design! Click here to see all the participants on the hop! Disclosure: I am on the design team for Scrapbook Adhesives by 3L® and A Jillian Vance Design and I receive product in return for blog posts. All opinions are my own. Happy Belated Thanksgiving, I hope yours was great. Between having the boys home from school, cooking, cleaning, and having to take down the computer (it normally lives on the dining room table), and then a bit of a family cell phone fiasco on Black Friday, I’m catching up on Friday’s blog post. This went up on A Jillian Vance Design on Friday. Yellow on a Christmas card? Yes, I know, but it seemed to go much better with the greens than anything else I tried to match it to. The watercolor effect is via Distress Ink. I have more detailed information on my post at A Jillian Vance Design, I’d love it if you clicked over to visit. Also, if you like this stamp (Oh Holy Night), it’s still on sale for the Black Friday promotion though Nov 30, and be sure to use the code BF2014 for additional discounts! Hello! I’m up on the A Jillian Vance Design Blog today with a Christmas card featuring the Majestic Deer die. It’s a really pretty die cut, with the elegant antlers. I love the silhouette it made against the green cardstock. You can see all the details on the AJVD blog. Disclosure: I am on the design teams for A Jillian Vance Design & Scrapbook Adhesives by 3L and receive product in return for projects. All opinions are my own. Welcome, I’m so excited you are here! 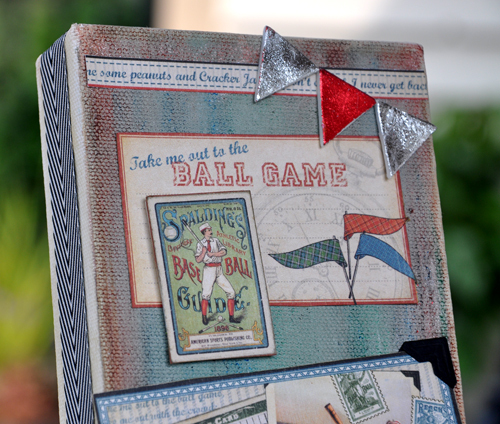 Today I’m blog hopping with Scrapbook Adhesives by 3L® and Graphic 45®, two of my favorite companies! 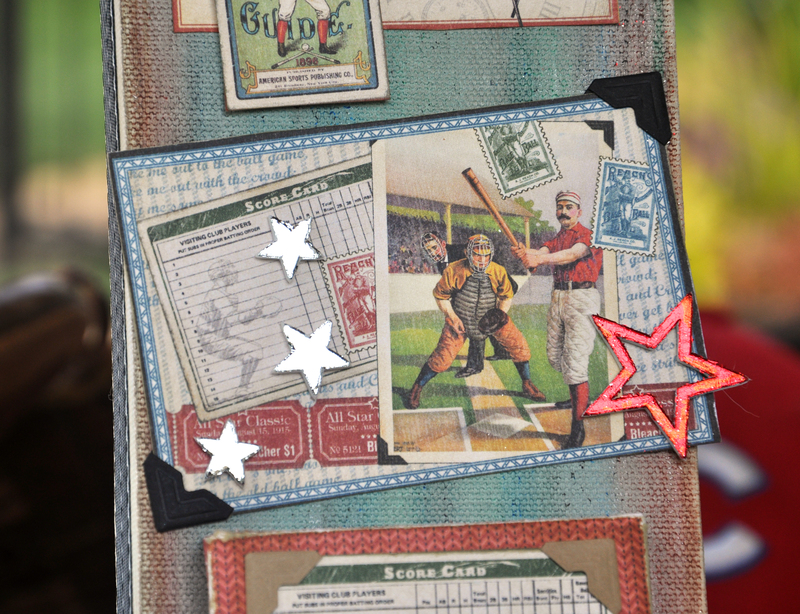 I’m using the Good Ol’ Sport Collection and a variety of adhesives on this 4 x 12 canvas. I live in a baseball obsessed house with my husband and 2 boys. I’ve actually been to all but 5 of the MLB parks. This will go perfectly in the man cave! I bought a set of 3 canvases a while ago, and well, there’s something about Graphic 45 paper that makes me want to get super creative. I layered the canvas with paint and stain on the sides, then used Gelatos on the front of the canvas for base colors. I wrapped a ribbon around the outside with Crafty Power Tape. 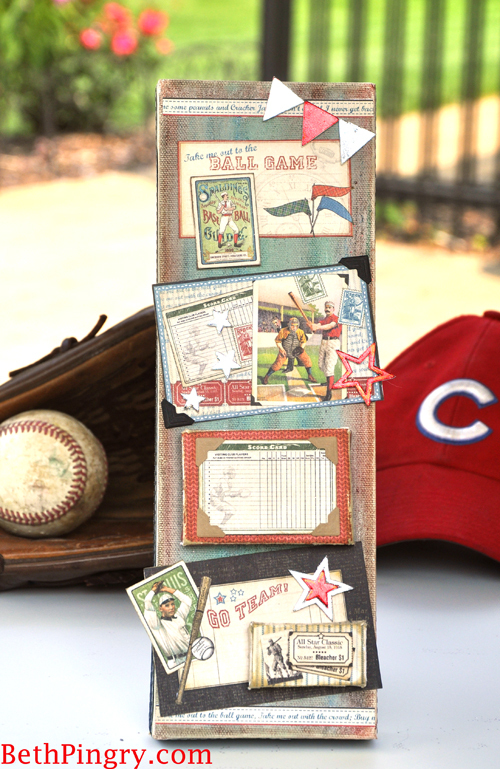 I used 3D Foam Pennants with craft foil, and layered the tiny borders with Crafty Power Tape. The top “spaldings” image is backed with Crafty Foam Tape to give it some dimension. Also, the 3D Foam is an awesome permanent adhesive! In the middle section, I used black Creative Photo Corners to mimic the image, and then added 3D Foam Stars with silver and red craft foils. I inked the edges of all the papers too. In this section I used mini canvases for additional dimension. 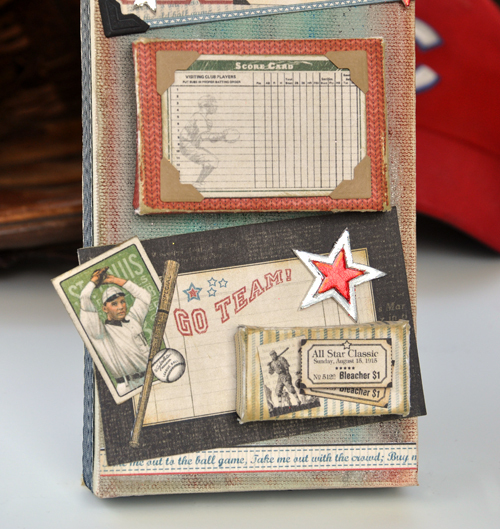 I added kraft Creative Photo Corners to the score card. I wrapped the mini canvases with paper and Crafty Power Tape, sanded and inked the seams. 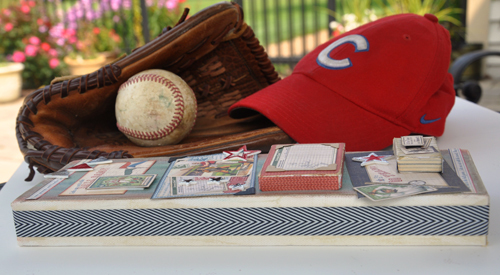 The little bleacher tickets are layered with Crafty Foam Tape. From this angle you can see the layers and dimension from the 3D Foam and the mini canvases. Thank You for stopping by today, I would love for you to follow my blog or Facebook page, Cookies for Breakfast. Enter through the Rafflecopter app on each blog each day with a comment. Additional entries are available by commenting on the Scrapbook Adhesives by 3L Instagram Page, be sure to tell us your profile name on the Rafflecopter app. You can also enter a third time via Facebook. Either click through the Rafflecopter app to comment on the Scrapbook Adhesives by 3L Facebook page, or click on the Giveaway tab on the Scrapbook Adhesives by 3L Facebook page. Each day there will be 2-3 new blogs to visit, and you can enter each day! Be sure to visit Graphic 45‘s Blog for their contests too! Beth Pingry – hey, that’s me! Disclosure: I am a designer for Scrapbook Adhesives by 3L, and have received product in trade for making projects. Blog Hop with Avery Elle – Seriously Awesome! 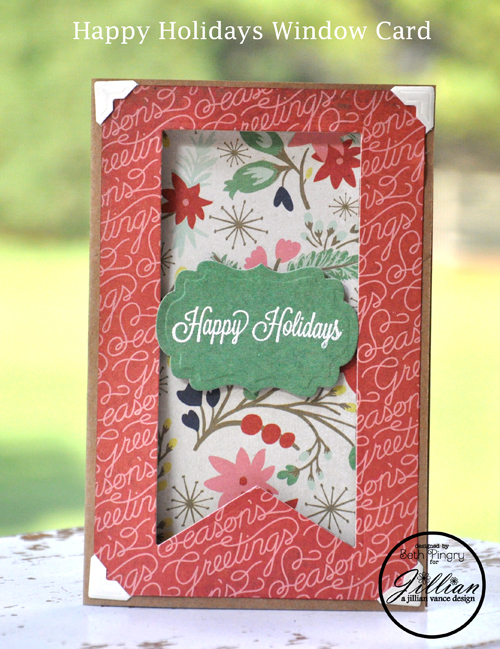 I’m blog hopping today with Scrapbook Adhesives by 3L and Avery Elle Stamps! 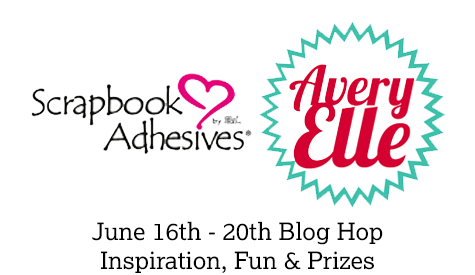 We have some great prizes, so make sure you visit the Scrapbook Adhesives by 3L® Blog to enter, and then follow the link to Avery Elle! Thanks for coming in, and now go and enter to win! Disclosure: I received stamps and adhesives for this blog post. Happy Friday all, and thanks for coming in today! I’m up for A Jillian Vance Design today. You can stop over there to see the close up of the Daily Doilies part, I used tissue paper and Adhesive Sheets, sprayed with Glimmer Mist.